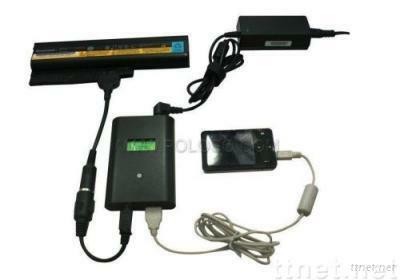 Functions: *This product is a portable charger for high capacity batteries of laptops. *Charge your laptop battery directly, without having to fix the battery to your laptop first. *Suitable for over 95% of laptops in market with the separate connecting wire. *Report battery voltage, charge/discharge cycle count, and other pertinent information. *Charge your USB peripherals with the USB port. *Charge voltage and current can be regulated automatically. *Simplify charging process, save your time and preserve your laptop, especially when you own two batteries or more.